Of course you write letters to Santa or about what you want for Christmas but I LOVE writing prompts that make kids laugh and think a little bit. One of my favorite prompts is "If Santa Rode the Bus" - you will get some seriously funny answers! Another prompt you'll get a lot of funny responses from is "If Santa Got Stuck" - ask your students what they think would happen if Santa got stuck in the chimney! Maybe the reindeer would help pull him out? Maybe his elves would come save him? I know a lot of you have classroom elves that play silly pranks on your class in December. 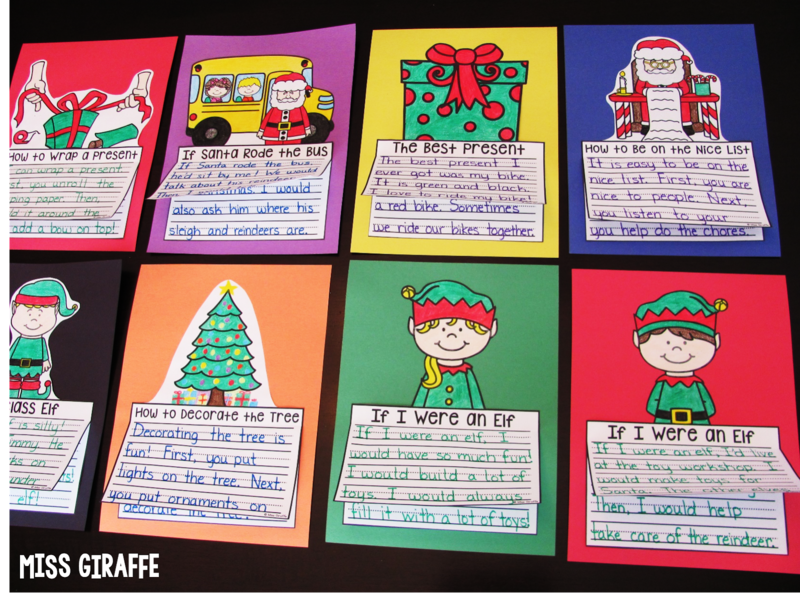 If you do, I created a craft for you to have your students write about your class elf. 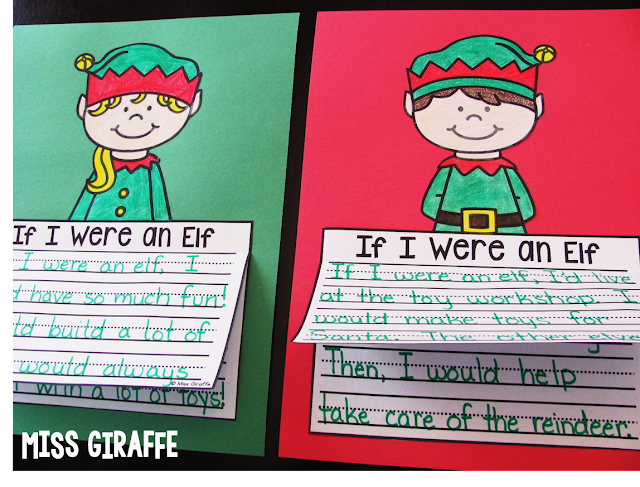 Another fun activity is to have students write about what THEY would do if they were elves. I include a boy version and a girl version so kiddos can color it to look like themselves. If you alternate red and green paper like this, it makes SUCH a cute bulletin board! My personal favorite holiday how to, though, is How to be on the Nice List. It's a GREAT activity to review making good choices. You can make it a great whole group lesson and brainstorm ideas on how to get on the nice list. 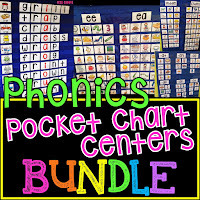 A super fun anchor chart is to draw a line down the middle of the chart and write "Naughty List" and "Nice List" on either side and have them help you fill it in! For opinion writing, have students write about THE BEST PRESENT. It could be the best present they ever received or maybe what would be the best present to receive. For more fun writing, have students pretend they got a reindeer as a pet! What would they name it? What would they do with it? What I love most about these writing crafts are how simple they are. It can be like pulling teeth to get some kids to write and you may even want to pull your own hair out trying to cut out 23 heads, 46 arms, etc. to prepare a writing craft for the holidays. With these, literally the ONLY thing you have to do is print them. You also don't have the stress of kids losing their pieces (the horror!) since it's all one piece. They're also wonderful for differentiation purposes.. every craft comes in 3 levels (4 writing lines as pictured in all of these as well as 5 and 6 line options) AND all 3 levels have "extra" pages you can add to the bottom of the stack to make the story longer. 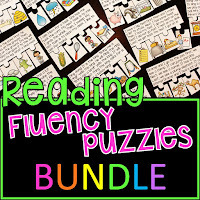 They could be entire books if you have kiddos that love to write! Speaking of books, I LOVE books about the gingerbread man! There are so many fun ones out there. 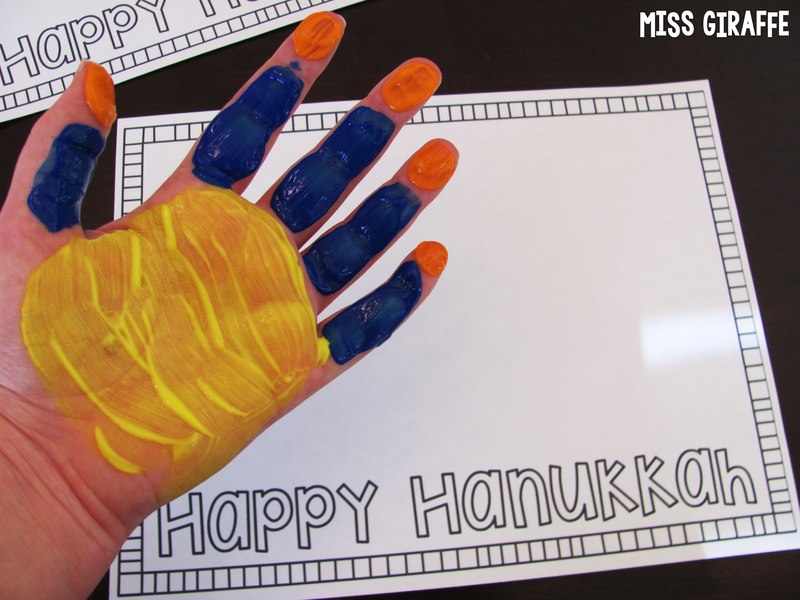 This is a fun craft to do after reading a fun gingerbread man book with your students. 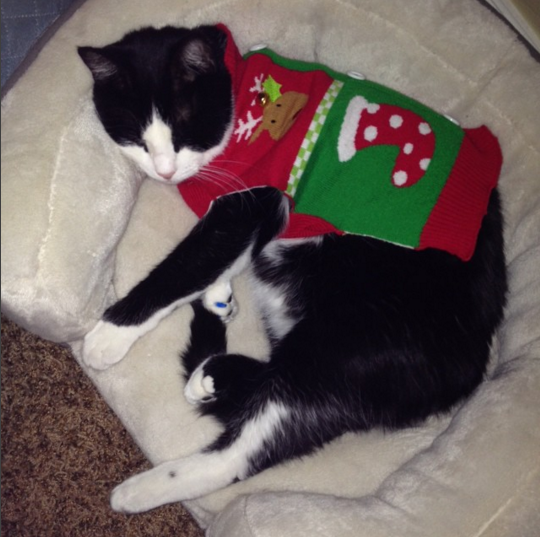 Okay, okay, last Christmas one (I love Christmas!) but I had to share this one. 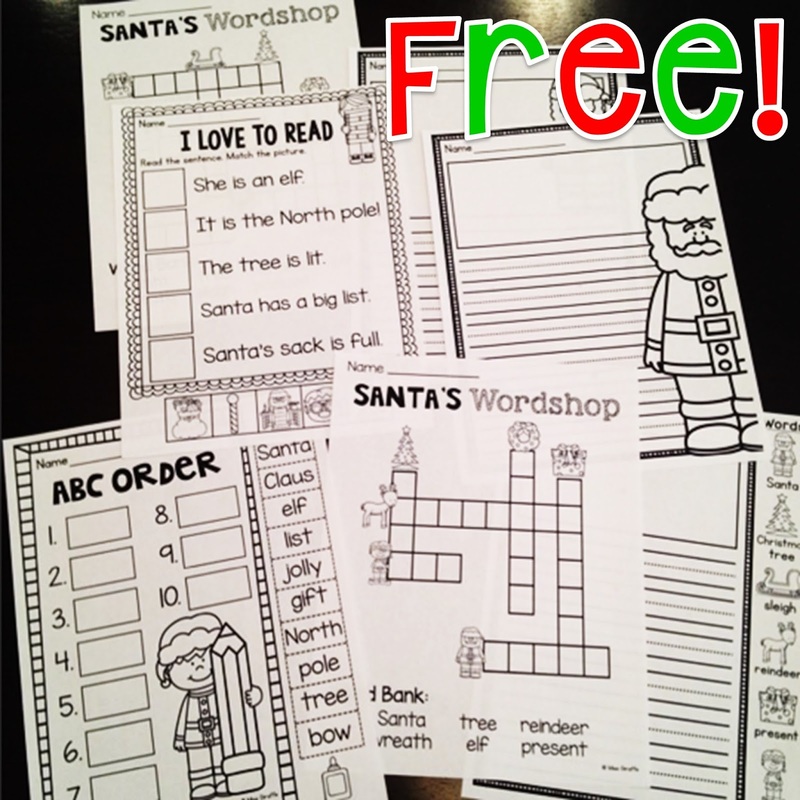 All of the above are just some of the Christmas crafts in my Christmas NO PREP Writing Crafts Bundle! December is also a really great time to incorporate social studies and geography by studying how other people celebrate in December. In my Christmas Around the World writing crafts bundle, I have some easy crafts you can do after learning about the different holidays. If you teach the customs of each holiday, the dreidel game is always a huge hit! 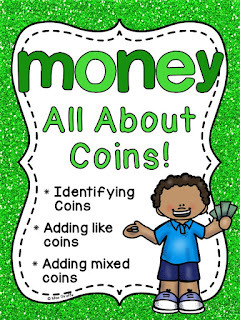 Teach them how to play and it's a GREAT game to practice counting/addition/etc. For the actual game, depending on which side the dreidel lands on, kids either take from the pot, give to the pot, or do nothing. So give your kiddos yellow cubes or yellow pom pom balls (to represent gelt) and a dreidel to spin. You can usually find 4 packs of dreidels at the dollar store! 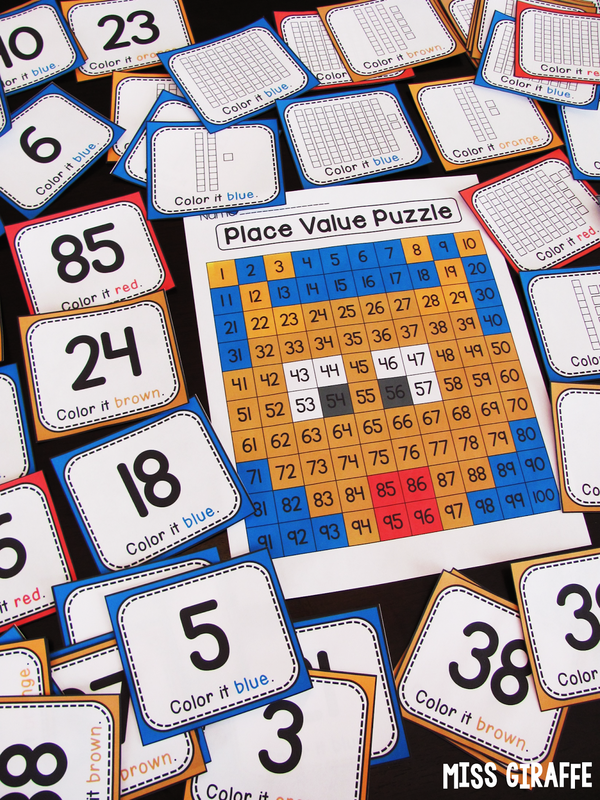 You can easily make it a fun math game by placing dot stickers on each side that say +1, -2, etc. to tell them what to do with their gelt. It's a ton of fun! Another craft I love to do for Hanukkah is hand print menorahs! To do this craft, paint each kids' hand yellow on their palms, blue on their fingers, and orange on their finger tips. Only do 1 thumb and leave the other clean for the candle in the middle. 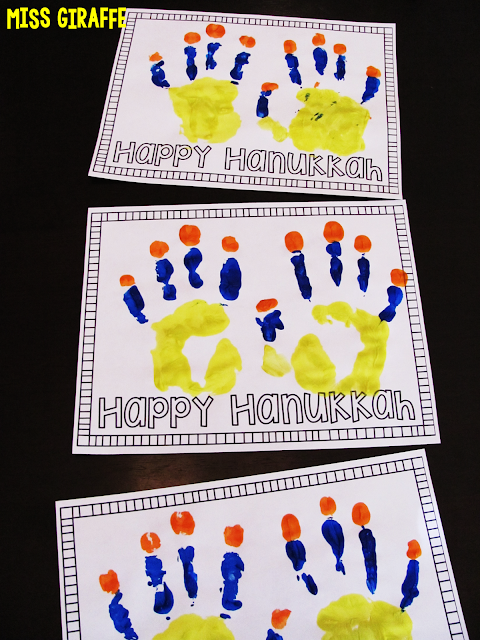 Then, have them put their thumbs on top of each other (painted thumb on bottom) and press down to make a menorah! 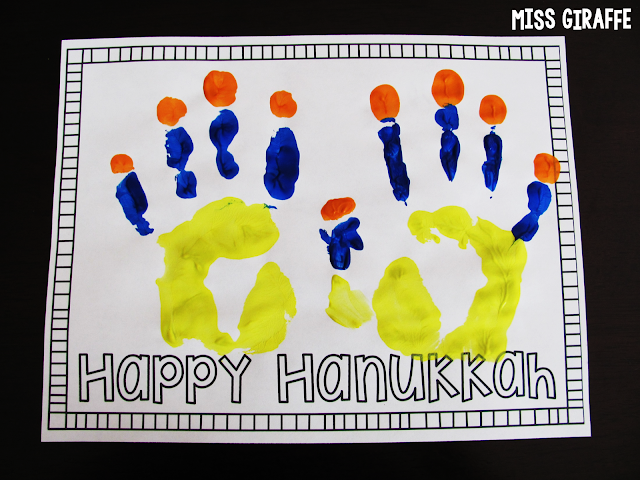 You can grab my Happy Hanukkah mat FREE to do this craft too! 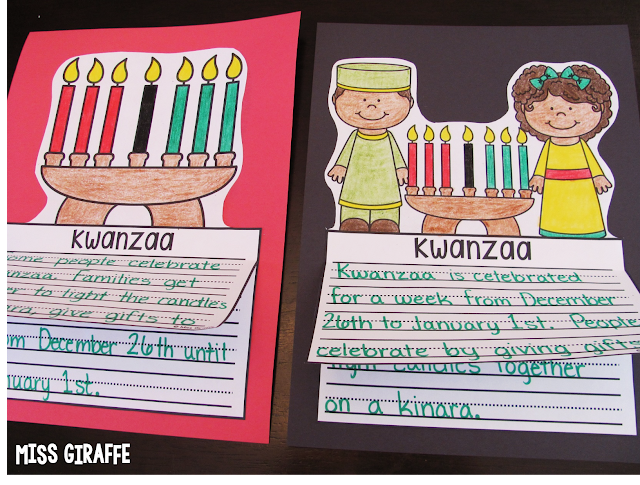 You can also add the glitter to the flames of the candles of the kinara for Kwanzaa as well! I am usually weary of glitter but I have come to accept that I will somehow find glitter on me every single day in December whether I use it or not. For this holiday, it's super fun to also have the kids make hats! For the girls, use a strip of green construction paper and staple it to fit their head. Then, have them make candles (glue a yellow flame onto a small strip of white cardstock so it's thick enough to stand up on its own) to glue onto the green construction paper. Have them glue it into the back so it pops out of the wreath. For the boys, fold a piece of white paper into a cone. Have them cut out 3 yellow stars to glue to the front of it. You can also have them make a star wand as well! Then there is Las Posadas! I grew up in a small border town in Arizona so there was a piñata at almost every outdoor birthday party I went to as a kid and I LOVED them. What kid doesn't like to be blindfolded and handed a bat to swing as hard as they can at a fun object with the hopes that candy rains on them?! I LOVED them! Whether you were the momentary rock star to break open the piñata or not, you still got to run under the piñata to gather as much candy as your little hands could hold as soon as it was broken! It's hard for me to imagine a piñata-less childhood, but if your students have yet to experience them, see if you can create the experience for them! Maybe ask your principal for permission first, though.. maybe :) If not, you could watch a video on it and then have the students write how to do it. 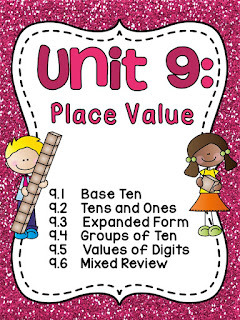 You can also make your own paper mache piñata with your class! Also for Las Posadas, I have this craft with Mary and Joseph if you teach your students about how Las Posadas is celebrated. 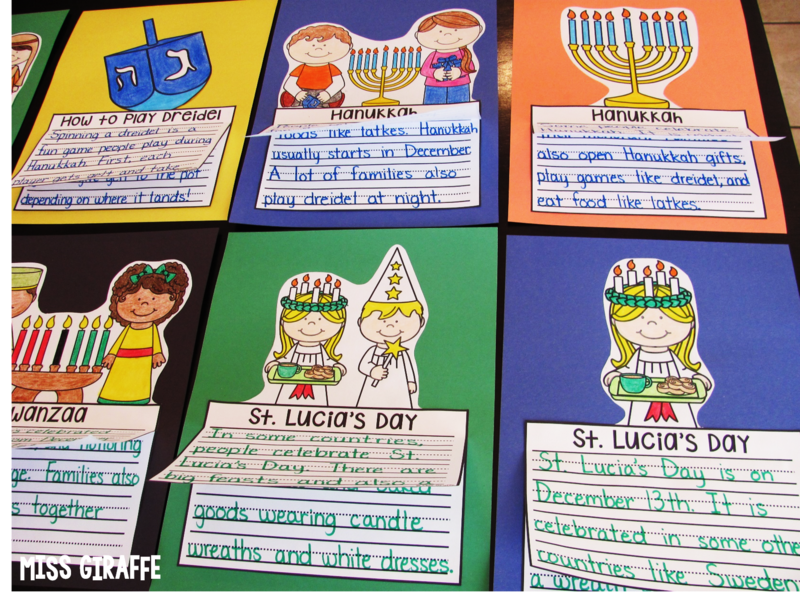 Like I said, you can grab ALL of these Hanukkah, Kwanzaa, St. Lucia's Day, and Las Posadas writing activities in the Christmas Around the World Writing Crafts Bundle or you can get them separately by clicking on the holiday. You can also snag ALL of these crafts and A TON MORE for a bunch of different holidays and themes in the NO PREP Writing Crafts Growing Bundle. It already has over 190 crafts in it! Once you buy it, you get all the new writing prompts I add to it for FREE so it's a great deal. I've been adding to that bundle like crazy and every time I do, I raise the price accordingly... and I plan on adding a ton more crafts for each holiday and different topics and writing themes so the earlier you get it, the more you save because you can re-download it at any time to get all the new crafts I add to it free! Aren't growing bundles awesome?! :) I wrote this post about them awhile back! Gosh, I love Christmas so I want to share just a few more things with you. I've also switched my behavior chart to Christmas! I LOVE it!! Get it here if you want it too! I wrote about switching out my behavior chart each month in my November post. It keeps it fresh and we all know teachers need all the help with managing behavior they can get in December! 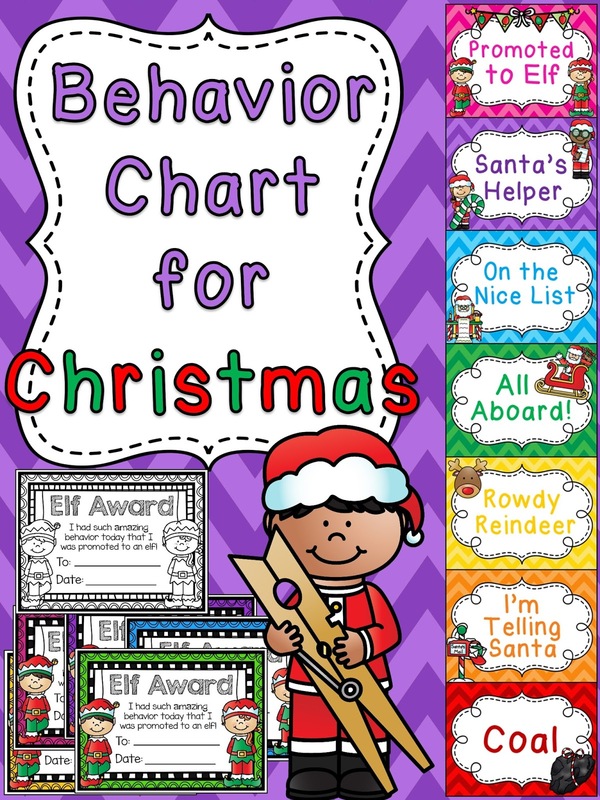 For this one, your students will hopefully be on their best behavior trying to get promoted to elf so they can take home the Elf Award to show their parents how awesome they are! And my FAVORITE Christmas math activity is my reindeer mystery picture! Kids grab mini cards that tell them what color to color each number with either the number "38" OR with base ten blocks where they have to figure out the number (it comes in both versions for easy differentiation)! And it reveals..... a reindeer!! Want more free stuff from me? 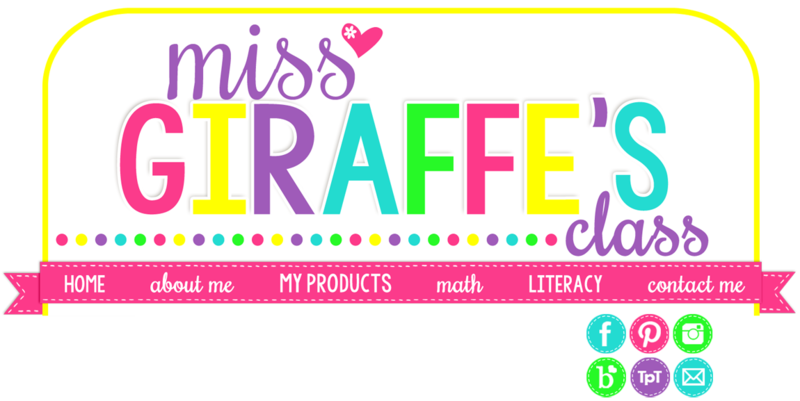 Join Miss Giraffe's Class so you never miss out on fun ideas and exclusive free stuff from me only for subscribers sent directly to your email! 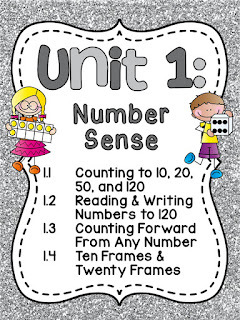 Also, follow me on Pinterest for more teaching ideas! Hope you all have a WONDERFUL holiday season! !